Pickle Barrel is now open, ready and waiting for YOU! Don't miss out on the notice about our plans for 2019 below! 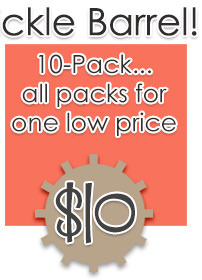 My 10-Pack contains everything in my Lazy Day collection, and you get it for only $10 ... It's the BEST deal you can get at only $1 per pack! 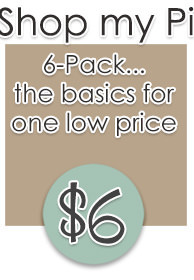 ​My 6-Pack contains just the basics - elements, page borders, paint/scatters, patterned papers, solid papers and templates. Still a great deal at $1 per pack! 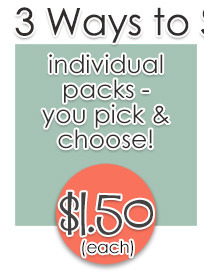 ​All 10 of the individual packs are also available separately, so you can mix & match and create your own bundle! If you make any $12 purchase in the store this week, you'll receive these Bonus Templates from Heather T FREE! Thanks for reading and I hope you have a wonderful scrappy day! Pickle Barrel Sneak & Win Winner! Stay tuned! Pickle Barrel will be opening soon! DECEMBER PICKLE BARREL SNEAK & WIN! Our Pickle Barrel sale is just around the corner! If you'd like to win a copy of my 10-Pack, leave a comment below by 12pm ET Tuesday, December 18th! NOVEMBER PICKLE BARREL: WINTER IS COMING! ​Pickle Barrel is now open, ready and waiting for YOU! ​My 6-Pack contains just the basics - elements, snowflake borders, paint/scatters, patterned papers, solid papers and templates. Still a great deal at $1 per pack! ​All 10 of my Winter is Coming packs are also available separately, so you can mix & match and create your own bundle! ​If you make any $12 purchase in the store this week, you'll receive these Bonus Templates from Laitha Studio FREE! ​hanks for reading and I hope you have a wonderful scrappy day! Stay tuned y'all! Pickle Barrel will be opening shortly!